A picture of the exact moment the blue-white team's corner kick is taken. Alessandro Del Piero taking a corner kick for Sydney FC. A corner kick is the method of restarting play in a game of association football when the ball goes out of play over the goal line, without a goal being scored, and having last been touched by a member of the defending team. The kick is taken from the corner of the field of play nearest to where it went out. Corners are considered to be a reasonable goal scoring opportunity for the attacking side, though not as much as a penalty kick or a direct free kick near the edge of the penalty area. A corner kick is also awarded instead of an own goal if a team places the ball directly into its own goal from certain restarts (e.g., throw-in, free kick, etc. ), though this is rare. The assistant referee will signal that a corner should be awarded by first raising his flag, then using it to point at the corner arc on their side of the pitch; however, this is not an indication of which side the kick should be taken from. The referee then awards the corner by pointing to the relevant arc. When taking a corner kick, the ball is initially placed so that at least some part of the ball is within the corner arc closest to where the ball went out of play. The corner arc is located at the intersection of the goalline and touchline and has a radius of one yard. All defending players must be at least ten yards (9.15 metres) from the corner arc until the corner kick is taken. A corner kick is taken as soon as the ball is kicked and moves. The attacking side may score directly from a corner kick, though this is uncommon. An attacking player who directly receives the ball from a corner kick cannot be penalised for offside. Opposing players must retire the required distance as stated above. Failure to do so promptly may constitute misconduct and be punished by a yellow card. It is an offence for the kicker to touch the ball a second time until it has been touched by another player; this is punishable by an indirect free kick to the defending team from where the offence occurred, unless the second touch was also a more serious handling offence, in which case a direct free kick is awarded to the defending team. Liverpool (red) players prepare to defend a Chelsea (blue) corner. A common tactic is for several attackers to stand close in front of the goal, whereupon the corner taker crosses the ball for them to head into the goal. The defending team may choose to form a wall of players in an attempt to force the ball to be played to an area which is more easily defended. However, this is not done often because defending players must remain at least 10 yards from the ball until it is in play. The defending team also has the choice of whether to instruct a player to place him or herself beside one or both of the goalposts to provide protection to the goal in addition to the goalkeeper. The thinking behind placing a player beside a goalpost is that it means more of the goal area is protected and there is no loss in the ability to play an offside trap because offside does not apply for the first touch from a corner, and it compensates for a keeper's positioning and/or reach. The defending team also has to decide how many players it needs to defend a corner. Teams may withdraw every player into a defensive area, however this diminishes the potential for a counter-attack if possession is regained, and as such, allows the attacking side to commit more players to attacking the goal. Withdrawing all players into a defensive area also means that if the ball is cleared from an initial cross, it is more than likely that the attacking team will regain possession of the ball and begin a new attack. In situations where a set-piece, such as a corner, is awarded to a side trailing by a single goal at the closing stages of a match where conceding further is of minimal consequence (i.e. in a knockout tournament) a team may commit all their players, including their goalkeeper, to the attack. Two popular strategies used for defending corners are called man marking and zonal marking. Man marking involves each defensive player at a corner given an attacking player to defend, with his or her objective being to stop the attacking player from heading the ball. The other tactic, zonal marking, involves allocating each player to an area of the box to defend (his or her "zone"). The objective for players in zonal marking is to get to the ball first if it enters their zone and head it away from danger before an attacking player can reach it. An alternative strategy for the attacking team is to take a short corner. The ball is kicked to a player located within ten yards of the kicker, to create a better angle of approach toward the goal. A rarely seen "trick" version of the short corner was attempted during a tense top-of-the-table Premier League clash between Manchester United and Chelsea in the 2008–09 season, causing much controversy and media discussion. The strategy involved United's Wayne Rooney, standing at the corner flag, pretending to change his mind about taking the corner and signalling to winger Ryan Giggs to do it instead. While leaving the arc, however, Rooney sneakily touched the ball, effectively putting it into play. With Chelsea's defence unprepared and expecting a conventional corner, Giggs took the ball, sprinted with it towards goal and crossed it for teammate Cristiano Ronaldo to score with a header. On this occasion, the goal was disallowed after the linesman, not having seen Rooney's taking of the corner, raised his flag, thus prompting the referee to stop play. The end result did not change much, though, as Manchester United scored again when the corner was retaken. A similar strategy was attempted by the Colombian national team at the 2014 World Cup against Greece, though once again the linesman penalized them for it. The strategy is rare. The ball, shot by Cesáreo Onzari, scores a goal for Argentina against Uruguay. This was the first goal scored direct from a corner, in 1924. It is possible to score direct from a corner kick if sufficient swerve is given to the kick, and/or there is a strong enough wind blowing in the goalward direction. This type of goal is called an Olympic goal (Spanish and Portuguese: gol olímpico) in Latin America. The name dates from 2 October 1924, a few months after IFAB had legalised such goals, when Argentina's Cesáreo Onzari scored against Uruguay, who had just won the 1924 Olympic title. The expression "Olympic goal" is uncommon in English-speaking countries, but has some use in the United States, for example by Max Bretos on Fox Soccer Channel, reflecting Latino influence on the sport's culture there. The goalkeeper is usually considered at fault if a goal is scored from a corner. Although FIFA states the first goal from a corner was scored by Billy Alston in Scotland on 21 August 1924, in fact Alston's goal was from a header on 23 August 1923. The first in England was by Huddersfield Town's Billy Smith on 11 October 1924. Portuguese footballer João Morais scored a direct corner kick for Sporting Clube de Portugal in the 1964 European Cup Winners' Cup Final, eventually deciding the match and the destiny of the trophy. The world record holder for most direct corner kick goals is a Turkish player named Şükrü Gülesin, during his career he scored 32 goals directly from corners. In the 1950s this apparently appeared in the Guinness Book of Records as a world best. The first Olympic goal at the Olympic Games was Megan Rapinoe's for the United States against Canada in the 2012 women's semifinal. The only Olympic goal in the World Cup was scored for Colombia by Marcos Coll, beating goalkeeper Lev Yashin in a 4–4 draw with the Soviet Union in the 1962 FIFA World Cup. In January 2012, Paul Owens took advantage of strong winds to score two goals direct from corners in the second half of Coleraine's 3–1 win over Glenavon in the Irish Premiership. Most methods of restarting the game do not permit the scoring of an own goal directly from the restart;[nb 1] if the ball enters the goal directly, a corner is awarded instead. This is the case for the kick-off, goal kick,[nb 2][nb 3] dropped-ball[nb 4], throw-in, corner kick,[nb 3] and free kick (indirect and direct). Such incidents are extremely rare, and in some cases require unusual or extraordinary circumstances in order to occur (for example, a ball from a corner kick would have to travel the entire length of the field and enter the kicker's own goal without being touched by any other player). In a 1983–84 English Third Division match, Millwall were incorrectly credited with a goal against Wimbledon rather than a corner, when Wally Downes' free-kick backpass eluded an off-guard Dave Beasant. In a 2002–03 FA Premier League match, Birmingham City scored when Olof Mellberg's throw-in backpass was missed by Aston Villa goalkeeper Peter Enckelman, who reacted with dismay but later claimed he had made no contact and the goal should not have been awarded. His reaction may have persuaded referee David Elleray that Enckelman had grazed the ball; manager Graham Taylor suggested it showed he was unaware of the corner rule, a charge Enckelman denied. Under the original 1863 rules of the Football Association, a ball kicked behind the goal-line was treated similarly to present-day rugby: if an attacking player touched the ball down first, the attacking team was awarded a free-kick at goal (similar to a conversion in rugby), while if a defending player touched the ball down first, the defending team was awarded a goal-kick. These rules were subsequently simplified, so that by 1867 a goal-kick was awarded in all circumstances, regardless of which team touched the ball. During this period, clubs around Sheffield played their own distinctive code of football. The laws promulgated in early March 1867 by the newly-formed Sheffield Football Association contained a similar rule: a goal-kick was awarded whenever the ball went behind the goal-line, regardless of which team touched the ball. The corner-kick was suggested in a letter to the editor of the Sheffield Daily Telegraph published on March 22nd 1867. The author, writing under the pseudonym "Rouge", argued that the then-current rule was "a great inducement to foul and dishonourable play, for it is manifestly to the advantage of a defending side to allow the ball to pass their goal line, they having the great advantage or a free kick-off". Instead, Rouge suggested, "when the ball is kicked behind the goal-line, the players [should] run for touch, and the side winning the touch, kicks in from the nearest corner-flag". When the ball is kicked over the bar of the goal, it must be kicked-off by the side behind whose goal it went, within six yards from the limit of their goal. The side who thus kick the ball are entitled to a fair kick-off in whatever way they please; the opposite side not being allowed to approach within six yards of the ball. When the ball is kicked behind the goal line, a player of the opposite side to that which kicked it out, shall kick it in from the nearest corner-flag; no player to be allowed within six yards of the ball until kicked. The corner-kick could be awarded to either the attacking or the defending team, depending on which team kicked the ball behind the goal-line. When the ball was kicked directly over the crossbar, by either team, a goal-kick was awarded to the defending team. The Sheffield clubs would retain this form of the corner-kick rule until they adopted the FA's rules wholesale in 1877. In 1872, the Sheffield Association successfully introduced the corner-kick into the Football Association's code. The new FA rule was identical to the Sheffield rule, as described above. When the defending team kicked the ball behind the goal-line, a corner-kick was awarded to the attacking team. In 1874, the kick was allowed to be taken from within one yard of the corner-flag, rather than from the flag itself. Initially, all other players were forbidden to be within six yards of the ball at a corner-kick; this was altered to all opposing players in 1888. In 1913 and 1914, the distance was increased from six yards to ten yards. When first introduced in 1872, the corner-kick was required to be taken from the corner-flag itself, which made it impossible to be offside directly from a corner. In 1874, the kick was allowed to be taken up to one yard from the corner-flag, thus opening up the possibility of a player being offside. In 1883 the law was amended to specify that a player could not be offside from a corner-kick. When it was first introduced in 1872, there was no restriction on scoring a goal directly from a corner-kick. In 1875, this was forbidden,, but it was subsequently legalised by the International Football Association Board (IFAB) meeting of 15 June 1924 with effect from for the following season. In 1997, the laws were amended to remove the possibility of scoring an own goal directly from a corner kick. When initially introduced in 1872, there was no restriction on dribbling from a corner-kick. In 1875, this was changed: it was forbidden for a player to touch the ball again after taking a corner-kick, before the ball had been touched by another player. In 1924, this restriction was accidentally removed, as an unintended consequence of the law-change allowing a goal to be scored directly from a corner. This possibility was exploited by Everton FC winger Sam Chedgzoy in a match against Arsenal FC on 15 November of that year. At the end of November, the International Football Association Board issued emergency instructions that dribbling was once again forbidden. The law was formally amended to prohibit dribbling at the next annual meeting of the Board, in 1925. The one-yard quarter-circle pitch marking is first explicitly mentioned in the Laws of the Game in 1938, but appears in the diagram of the pitch as early as 1902. In the 1990s the Laws of the Game were updated to explicitly allow optional marks on the goal line (and later the touch line) ten yards from the corner flag, to aid the referee in ensuring defenders keep the minimum distance from the corner kick. The Dublin City Cup (until the 1960s) and Dublin and Belfast Inter-City Cup (in the 1940s) used corner count as a tiebreaker in knockout rounds. This table includes only kicks awarded to the attacking team; it does not cover the defensive corner-kick that existed under the 1872 laws. ^ A theoretical exception is the penalty kick; however, since the ball must be kicked forward, an own goal from a penalty kick would require an extraordinary set of circumstances to occur. ^ This was added to the Laws of the Game in 2012, in order to prevent scoring a goal on an "uncontested" dropped-ball. A corner kick is only awarded if the ball enters the own goal directly from the first touch after a properly taken dropped-ball; an improperly taken dropped-ball is retaken. (LOTG) International Football Association Board (2017). "Laws of the Game 2017–2018" (PDF). FIFA. ^ a b c d e "Getting to grips with the 'gol olímpico'". Off the ball. FIFA. 2 January 2015. Retrieved 16 August 2017. ^ a b c d e Barnade, Oscar (October 2004). "El gol olímpico cumple 80". Clarín (in Spanish). Retrieved 17 November 2009. ^ a b Freddi, Cris (March 2003). "Gol olimpico". When Saturday Comes. Retrieved 17 November 2009. ^ Christenson, Marcus (27 March 2012). "Has anyone scored more than Lionel Messi in one season?" – via The Guardian. ^ Wahl, Grant (6 August 2012). "Olympics: USA vs Canada". Sports Illustrated. CNN. Retrieved 25 August 2017. ; Wahl, Grant (6 August 2012). "Unquiet American". Sports Illustrated. ^ BartholomaeusBaer (22 January 2012). "Paul Owens scores two direct corners in a game" – via YouTube. ^ LOTG 14 "A goal may be scored directly from a penalty kick"
^ LOTG 14.1 "The player taking the penalty kick must kick the ball forward"
^ Thomas, Andi (14 April 2016). "The rules of soccer are changing! You can't score an own goal from a corner anymore". SBNation. Retrieved 15 August 2017. ^ "2016–2017 Law Changes for USSF Referees" (PDF). HVSRA. June 2016. pp. 42, 44. Retrieved 16 August 2017. ^ Simpson, Paul; Hesse, Uli (7 November 2013). "Why can'y you score an own goal from a direct free kick?". Who Invented the Stepover? : and other crucial football conundrums. Profile Books. p. 78. ISBN 9781847658425. Retrieved 16 August 2017. ^ Ward, Andrew (12 February 2016). "Referee who Forgot the Rules". Football's Strangest Matches: Extraordinary but true stories from over a century of football. Pavilion Books. p. 148. ISBN 9781911042280. Retrieved 16 August 2017. ^ "Freak goal stuns Taylor". BBC Sport. 17 September 2002. ^ Parish, Steve (November 2002). "Wrong side of the laws". When Saturday Comes (189). Retrieved 16 August 2017. ^ "Enckelman: I knew the rules". TheGuardian.com. 17 September 2002. Retrieved 16 August 2017. ^ Laws of the Game (1863) – via Wikisource. In case the ball goes behind the goal line, if a player on the side to whom the goal belongs first touches the ball, one of his side shall be entitled to a free kick from the goal line at the point opposite the place where the ball shall be touched. If a player of the opposite side first touches the ball, one of his side shall be entitled to a free kick (but at the goal only) from a point 15 yards from the goal line opposite the place where the ball is touched. The opposing side shall stand behind their goal line until he has had his kick. ^ Laws of the Game (1867) – via Wikisource. When the ball is kicked behind the goal line, it must be kicked off by the side behind whose goal it went, within six yards from the limit of their goal. ^ Sheffield Rules (March 1867) – via Wikisource. When the ball is kicked behind the goal line or over the bars of the goal or rouge flags, it must be kicked off by the side behind whose goal it went, within six yards from the limit of their goal. ^ a b "Rouge" (22 March 1867). "To the editor of the Sheffield Daily Telegraph". Sheffield Daily Telegraph (3680): 4. ^ Sheffield Rules (1868) – via Wikisource. ^ Laws of the Game (1873) . 1873 – via Wikisource. ^ a b Laws of the Game (1883) – via Wikisource. When a player kicks the ball, or throws it in from touch, any one of the same side who, at such moment of kicking or throwing, is nearer to the opponents' goal-line is out of play, and may not touch the ball himself, nor in any way whatever prevent any other player from doing so until the ball has been played, unless there are at such moment of kicking or throwing at least three of his opponents nearer their own goal line; but no player is out of play in the case of a corner-kick or when the ball is kicked from the goal line, or when it has been last played by an opponent. ^ Laws of the Game (1874) – via Wikisource. When the ball is kicked behind the goal-line by one of the opposite side, it shall be kicked off by any one of the players behind whose goal line it went, within six yards of the nearest goal post; but if kicked behind by any one of the side whose goal line it is, a player of the opposite side shall kick it from within one yard of the nearest corner flag-post. In either case no other player shall be allowed within six yards of the ball until kicked off. ^ Laws of the Game (1888) – via Wikisource. When the ball is played behind the goal-line by one of the opposite side, it shall be kicked off by any one of the players behind whose goal line it went within six yards of the nearest goal-post; but if played behind by any one of the side whose goal-line it is, a player of the opposite side shall kick it from within one yard of the nearest corner flag-post. In either case no opponent shall be allowed within six yards of the ball until it is kicked off. ^ "Minutes of the AGM of the IFAB" (PDF). London: SSBRA. 15 June 1924. p. 3. Archived from the original (PDF) on 16 June 2011. Retrieved 29 November 2009. ^ "International Football Assocation Board: 1997 Minutes of the Annual General Meeting" (PDF). p. 140. Retrieved 8 October 2018. ^ "International Football Assocation Board: 1924 Minutes of the Annual General Meeting" (PDF). p. 4. Retrieved 16 October 2018. ^ "That Corner Kick Rule". The Daily Mail. Hull (12209): 2. 19 November 1924. ^ "Corner Kick Ruling". Western Morning News. Plymouth (20189): 2. 29 November 1924. ^ "Off-Side Change Carried". Berwickshire News. Duns: 8. 23 June 1925. ^ "International Football Assocation Board: 1925 Minutes of the Annual General Meeting" (PDF). p. 4. Retrieved 16 October 2018. ^ Farrell, Gerard (1 October 2015). "The 1945 Inter-City Cup: War, Goals, Controversy and death by corner kicks". Bohemian FC. Retrieved 16 August 2017. ^ DeLoughry, Sean (28 May 2015). "Ireland - Dublin City Cup Winners". Rec.Sport.Soccer Statistics Foundation. Retrieved 16 August 2017. The penalty area or 18-yard box is an area of an association football pitch. It is rectangular and extends 16.5m to each side of the goal and 16.5m in front of it. 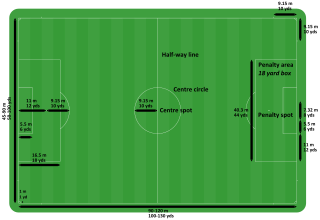 Within the penalty area is the penalty spot, which is 10.97 metres (36.0 ft) or 12 yards from the goal line, directly in-line with the centre of the goal. A penalty arc adjoins the penalty area, and encloses the area within 9.15m from the penalty spot; it does not form part of the penalty area and is only of relevance during the taking of a penalty kick. Offside is one of the laws of association football, codified in Law 11 of the Laws of the Game. The law states that a player is in an offside position if any of their body parts, except the hands and arms, are in the opponents' half of the pitch, and closer to the opponents' goal line than both the ball and the second-last opponent. A penalty kick is a method of restarting play in association football, in which a player is allowed to take a single shot on the goal while it is defended only by the opposing team's goalkeeper. It is awarded when a foul punishable by a direct free kick is committed by a player in his or her own penalty area. The shot is taken from the penalty mark, which is 12 yards (11 m) from the goal line and centred between the touch lines. A football pitch is the playing surface for the game of association football. Its dimensions and markings are defined by Law 1 of the Laws of the Game, "The Field of Play". The surface can either be natural or artificial. Artificial surfaces must be green in colour. The pitch is typically made of turf (grass) or artificial turf, although amateur and recreational teams often play on dirt fields. A throw-in is a method of restarting play in a game of football when the ball has exited the side of the field of play. A dropped-ball is a method of restarting play in a game of association football. It is designed to offer no advantage to either side, generally being awarded when play has been stopped due to reasons other than normal gameplay, fouls, or misconduct. The rules concerning the dropped-ball are part of Law 8 of the Laws of the Game. A kick-off is the method of starting and, in some cases, restarting play in a game of association football. The rules concerning the kick-off are part of Law 8 of the Laws of the Game. The rules of Australian rules football were first formed by the Melbourne Football Club in 1859, and been refined over the years as the game evolved into its modern form. The laws significantly predate the advent of a governing body for the sport. The first national and international body, the Australasian Football Council, was formed in 1905 to govern Australian Football. Since 1994, the rules for the game known as Australian football have been governed by the AFL and the organisation's Laws of the Game committee. A comparison of American football and rugby union is possible because of the games' shared origins, despite their dissimilarities. Rugby union is a contact sport that consists of two teams of fifteen players. The objective is to obtain more points than the opposition through scoring tries or kicking goals over eighty minutes of playing time. The Play is started with one team drop kicking the ball from the halfway line towards the opposition. The rugby ball can be moved up the field by either carrying it or kicking it. However, when passing the ball it can only be thrown laterally or backward. The opposition can stop players moving up the field by tackling them. Only players carrying the ball can be tackled and once a tackle is completed the opposition can compete for the ball. Play continues until a try is scored, the ball crosses the side line or dead-ball line, or an infringement occurs. After a team scores points, the non-scoring team restarts the game at the halfway with a drop kick towards the opposition. The team with the most points at the end wins the game. In games of association football teams compete to score the most goals during the match. A goal is scored when the ball passes completely over a goal line at each end of the field of play between two centrally positioned upright goal posts 24 feet (7.32 m) apart and underneath a horizontal crossbar at a height of 8 feet (2.44 m) — this frame is also referred to as a goal. Each team aims to score at one end of the pitch, while also preventing their opponents scoring at the other. Nets are usually attached to the goal frame to catch goalscoring balls, but the ball is not required to touch the net. Futsal began in the 1930s in South America as a version of association football, taking elements of its parent game into an indoor format so players could still play during inclement weather. Over the years, both sports have developed, creating a situation where the two sports share common traits while also hosting various differences.